Quick to make. Great mix of flavours. Mix together the cinnamon, ginger, olive oil, half the lemon juice and seasoning and pour over the chicken. Coat well, then leave to stand for 10 minutes. Pour 400ml boiling water over the couscous and leave to stand for 5 minutes. Heat a ridged grill pan or non-stick frying pan over a medium heat. Add the chicken fillets and cook on both sides for 6–8 minutes, turning once, until cooked through with no pink meat. Meanwhile, fork through the couscous to break up any lumps. Stir in the mango, pumpkin seeds and seasoning. Whisk together the remaining lemon juice and yogurt and stir through. 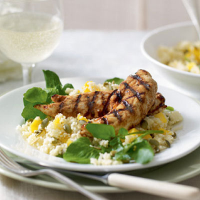 Arrange the watercress over the base of a large shallow serving dish, top with the couscous, then arrange the chicken fillets on top before serving. The mango couscous also goes really well with fish, such as salmon. Gewürztraminer is a wonderfully versatile grape with spicy minerality. Here the flavours cry out for a clean, New World example: Cono Sur Gewürztraminer Bío-Bío Valley, Chile.